Here's an update of a post that I wrote back in 2012 that might be of use to anyone aiming to start running or wanting to increase their running. My current running goal is to run 3 times a week, complete a half marathon later this year and a marathon next year. But I know how hard it is to get started, stay motivated and progress healthily. If you're new to running or thinking of increasing your mileage the key is to take your time as your body adjusts to the increased exertion. Run/walk to start with. When you start out add short bursts of running to your usual walking. Gradually increase the ratio of running to walking. If you're increasing your mileage walking some of the way can help your body to adjust. Increase your distance/time by no more than 10 per cent each week. Stretch before and after running. Focus on stretching your hamstrings, gluteal, calf and quadriceps muscles to help prevent common injuries. Ease down your pace as you finish running and walk for a few minutes before you put the key in the door. Then repeat some of your stretches. 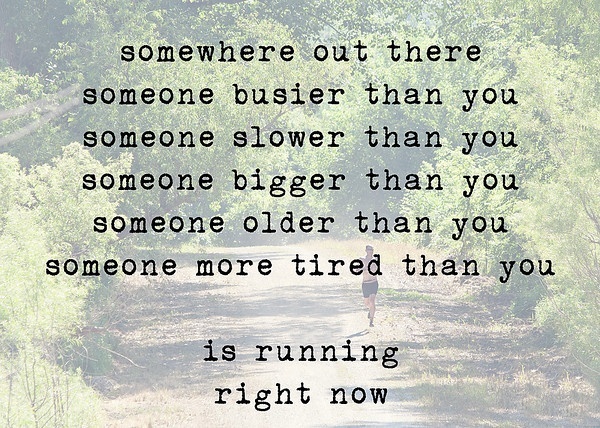 Run at a time to suit your own body clock. Choose a time that suits you. Buy the best running shoes you can afford. Ideally buy your shoes or at least seek advice from a shop where the staff have expertise in the products they sell and can match the shoe to your running style/gait. Be honest about your budget at the onset as they might be able to discount a shoe that's about to be discontinued (this happened to me and I made a big saving). All women need to wear a good sports bra for running. This is true regardless of your cup size. Eat more complex carbohydrates on running days. Ideally fuel your body 2-3 hours before a run and try to eat a snack 30 minutes afterwards. Take on more water than usual before and after a run. Listen to your body. Allow plenty of rest days and if you notice sharp pains in your legs or ankles rest for at least 3 days. If your pains persist consult a doctor. Have the occasional easy week. If you've been increasing your mileage for several weeks allow a lighter week to help ease fatigue and maintain motivation. Build a running routine. Eliminate excuses by laying out your kit the day before your run. Plan what time you'll leave the house and stick to it. Reward yourself afterwards. Variety is the spice of running. Plan a few safe routes that you know well and can vary. Enjoy long slow runs but also the occasional short fast one too (with plenty of warm up/cool down time). Run at different times of the day, in different weather conditions, on your own, with a friend or join a running club. No run need ever be the same. Set a goal. This could be to complete an event or improve your health. With time you'll notice a difference in your strength and muscle tone. 1. It's flexible. Running is easy to fit into your schedule because you can go for a run at any time of day to suit you. You're not subject to complicated timetables and cancelled classes. You can run anywhere even if you're away from home. 2. It's eco friendly. Unlike the use of high tech gyms running outside does not require any heating costs or use any electricity. Good advice - after my recent injury I think I need new shoes and a better stretching routine. It'll be run/walk for me since I'm so ancient but do hope to do the Race for Life in July so once this knee is better I'm 'training'. I've never been a runner, but love to walk. I used to have a really good walking routine, but I let it slide and now I'm looking forward to getting back into it. For me it was far more pleasant then a gym, and offered mental as well as physical benefits. I'm afraid this would be a step too far - sorry, no pun intended. I am 70 and have osteo arthritis. It's all I can do to walk, but it sounds fun to run! But I do think running is a present-day fad, like always going around with a bottle of water or plugged in to a personal sound system ... we never ran in the 1950s, apart from for a bus! We kept fit because everything needed some sort of effort - we didn't have washing machines all that often, dishwashers were certainly something we'd not yet seen, fires had to be laid or cleared out, coal brought in, and if we didn't walk to school or work, we caught the bus which, as I say, we often had to run for! It's only in our very sedentary, cushioned lives now that we run for pleasure and not necessity. But if it's fun, then run!